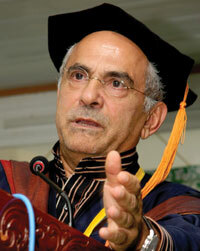 JOSE Ramos-Horta, the president of East Timor, touched on topics ranging from the prospect of peace to the importance of combating climate change during a speech at the University of Cambodia on Wednesday, during which he also drew parallels between Cambodian history and that of his own country. In comments that spanned an hour, Ramos-Horta said that Cambodia’s and East Timor’s pasts shared “tragic similarities”, arguing that both countries had been victims of genocide, armed conflict and the fallout of the Cold War-era. Ramos-Horta, who is on his third visit to the Kingdom, said it was regrettable that world leaders had not learned more from the devastation wrought by World War II. “If you look at the statistical data since World War II, tens of millions of people have died in conventional warfare,” he said. “Soon after World War II, we had Cambodia”, he added, referring to the civil war in the 1970s. He went on to question whether it was realistic to hope for world peace. “Is peace realisable in our lifetime? I would say probably not. But I do not give up on humanity,” he said. Ramos-Horta said that acts of “humanity”, including the international community’s response to the earthquake in Haiti in January and to the December 2004 tsunami that struck the Indian Ocean, had given him reason for optimism. However, he bemoaned the fact that there were still numerous ongoing wars spurred by “different motivations”, and asserted that many of them are based on “ignorance”, which he said underscored the need to educate children about “tolerance”. “There are no shortcuts, no instant solutions to conflicts. Our country … is one such example,” he said, referring to East Timor’s tumultuous path to independence. Looking ahead, he said Asia has the opportunity to lead the world on issues such as climate change, poverty eradication and sustainable development, and suggested that Asian nations develop a fund to address these and other issues. He also predicted that East Timor would be able to join the Association of Southeast Asian Nations by 2012 if it is able to maintain peace and sustain development. Eang Sophalleth, a spokesman for Prime Minister Hun Sen, said Wednesday that during talks held following the speech, the premier had pledged his support for East Timor’s ASEAN bid. Each leader also agreed to send delegations to the other’s country to explore economic, trade and agricultural opportunities, he said.